One of the ironies of Martin O’Malley’s eight years as Maryland governor is that a progressive, liberal Democrat spent most of his time cutting budgets and raising taxes just to keep the ship of state afloat. Another irony is that O’Malley started his tenure in 2007 by acting too slowly to stem a predicted tide of red ink in Annapolis. Now he is ending his second term by again responding too late to a huge, looming budget deficit. However, when the history of the O’Malley years is assessed by scholars decades from now, what will stand out is the ease with which Maryland navigated the Great Recession — the nation’s worst economic decline since the 1930s. The credit belongs to Martin O’Malley. He eventually bit the bullet and did what Democrats hate above all else — he cut back on government services to the middle and lower classes, especially those who need a helping hand. He found ways, though, to temper these hammer blows — shifting large sums from flush government accounts, borrowing heavily on the bond market, converting cash payments for farmland and Chesapeake Bay preservation into 15-year bonds and raiding the transportation fund. When that wasn’t enough, O’Malley taxed the wealthy, raised the corporate tax, raised the sales tax, raised the tobacco and alcohol taxes and the gasoline tax. These weren’t popular moves, but it meant that social services for those without much money or with disabilities still could turn to Annapolis for assistance. It still remains a mystery why O’Malley, who had weathered a host of fiscal storms as mayor of Baltimore for eight years, hesitated to recognize the brewing recession as he took office. Legislative analysts already were predicting a future budget hole of $1.5 billion. Yet O’Malley ignored these forecasts. Instead, in his first budget he hiked school construction handouts to a record $400 million, froze tuition for state college students by pouring extra funds into those institutions, and stripped the state’s Rainy Day fund of $1 billion to paper over Maryland’s financial woes. Even as O’Malley’s initial budget was being passed, though, the state’s sales tax collections were declining as were other revenue sources. Loud alarms should have sounded in the governor’s office. Within months, O’Malley was forced to backtrack. He raised a slew of taxes, cut his initial budget requests and reversed his opposition to casino gambling. The state’s worsening fiscal reality followed O’Malley throughout his two terms. By the end, he was still unwilling to take proactive steps in mid-2014 to prevent what became an 18-month, $1.2 billion fiscal hole created by an agonizingly slow economic recovery and budget reductions coming from Washington. Only in the past week did the governor seek $400 million in reductions so he could leave office with his final budget in balance. Yet his last-minute actions did nothing to close the $800 million budget hole he bequeaths to Gov.-elect Larry Hogan Jr.
O’Malley’s budget hold-downs also were never meant to represent a permanent reduction in state government’s expanding role in Maryland society. He is a strong believer in the good that government can do for people. He wants to deliver more education help, more health care access, more social services for the state’s underclass and more aid to the counties and the middle class. 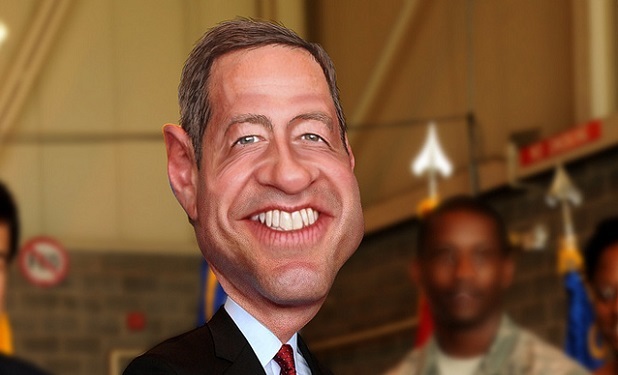 O’Malley’s faith in Big Government puts him on the far left of the Democratic Party’s spectrum. “Big things done well make even bigger things possible,” he said early in his first term. He still feels that way. The governor certainly put his ideas into action. He expanded health insurance in Maryland well before Washington acted. He was quick to crack down on handgun and assault weapons sales in Maryland. He fought vigorously to allow gay marriages in Maryland. He raised the minimum wage. He abolished the death penalty. And he made it easier for children of immigrants to attend local colleges and universities. He also won the hearts of environmentalists — another core group within the Democratic Party. O’Malley raged against the “greed” of utility executives intent on selling Constellation Energy and demanded stiff concessions, including monetary support for wind and other alternative power sources. He signed a super-expensive agreement to clean up the Chesapeake Bay. He pushed through legislation providing a lucrative subsidy for off-shore wind farms. He restricted the use of chicken manure as fertilizer on Maryland’s Eastern Shore. He delayed approval of hydraulic fracturing of shale deposits for oil and natural gas drilling in far Western Maryland. He promoted an aggressive “smart growth” strategy. Not all these steps were popular or successful. The governor’s “rain tax” to generate stem excessive stormwater runoff, ran into heated local opposition. His failure to keep an eye on the terribly mismanaged Obamacare rollout remains a major black mark. But overall, O’Malley leaves Maryland with a record of accomplishments that defines him as a progressive Democrat who largely delivered on his promises, despite governing in extraordinarily difficult economic times. As a politician, Martin O’Malley cobbled together a strong Democratic coalition throughout the state. He dominated political Maryland. Yet he largely disappeared from last year’s gubernatorial campaign, refusing to defend his record. That was a huge mistake. Republican Hogan had a field day pummeling O’Malley, who was never there to respond. Hogan’s easy victory on Nov. 4 signaled a sharp change in the state Democratic Party’s fortunes. The efficient statewide organization O’Malley had created disintegrated. The party lost much of its previous support in towns and communities beyond Baltimore City, Montgomery County and Prince George’s County. Without O’Malley, Maryland Democrats appear leaderless and in disarray. Now it is on to what O’Malley hopes will be much bigger things. He’s actively exploring a run for president. A pipe dream? Tell that to Jimmy Carter or Bill Clinton — small-state governors who beat the odds. O’Malley was far from an ideal governor, but he gave Maryland honest, intensely dedicated service. The state is better off than it was when he arrived to take the oath of office in the Senate chambers in 2007. Amid rising crime in a poor city, Baltimore’s force must transform itself in almost every conceivable way, from its basic approach to policing and the technology it uses to the data it collects to the transparency and accountability it has historically shunned. Part 2 of a four-part series.